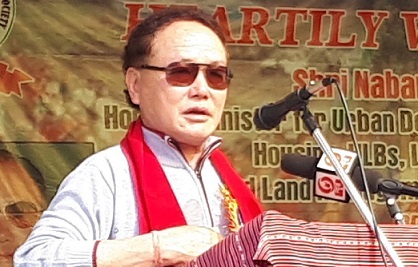 Batting for protection and preservation of wildlife and forests, Arunachal Pradesh Environment & Forests Minister Nabam Rebia on Saturday directed the officers concerned of the Papum Pare district administration to seize illegal arms and initiate legal action against those who are involved in the hunting and killing of wild animals. “In the name of agriculture, settlement and construction of infrastructure, around two hundred rivers of the State have dried so far. The people of those areas who were totally dependent on the rivers and streams are facing great difficulty in today’s date,” claimed Rebia adding due to disturbance at catchment areas, the urban population is already facing acute shortage of water supply. He further appealed to the gaon burhas (village chiefs) and administration to spread the message and report any discrepancies to the department concerned for strict action. Further, referring to a public memorandum for establishment of a Range Forest Officer (RFO) office at Sangdupota, Rebia assured that the same would be done by July next. “We will also engage two forest guards from the locality on contractual basis,” he said directing the DFO to prepare an estimate for construction of the office at the earliest. Speaking on the occasion, Principal Chief Conservator of Forests (PCCF), Omkar Singh, highlighted the impact of global warming in the State. Also, emphasizing on the ban on plastic use, he encouraged the people to carry out more tree plantations. The PCCF appealed to the villagers to opt for horticulture and other allied activities instead of jhum cultivation and stop the consumption of wild animals and birds. Among others, PCCF additional officer, RK Singh and DFO Neelam Nido spoke on the occasion. The day saw the dignitaries, officers and officials of the Forest Department and locals plant more than 1000 saplings of varied species. A check gate was also inaugurated by Minister Rebia at Tadarboding later in the day. The gate has been constructed by ABYA to curtail illegal sale of timbers and other forest products. A pledge to protect forest and wildlife and a signature campaign were the other highlights of the day.